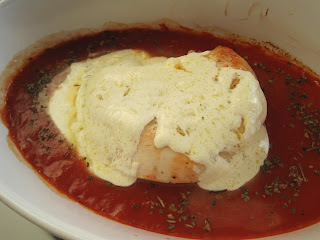 One of my favorite quick meals to make is easy chicken parm in tin foil. I was all set to make that tonight when I realized, shockingly, I ran out of tin foil! I can't remember the last time that happened, but I'd used the last paltry square to wrap up the leftovers of my Trader Joe's pizza. As I was saying...there goes the no-clean up recipe. 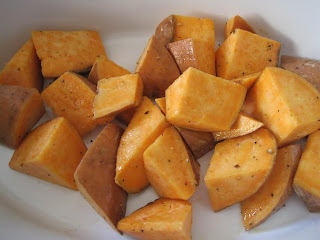 Instead I went stove-top, browning the chicken on both sides while roasting some sweet potato (1 small one, diced into 1-inch pieces) in the oven. 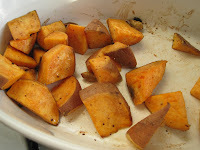 I tossed the sweet potato in salt, freshly-cracked pepper and olive oil, then threw in a few whole cardomom pods just to see how that might work. For the last 5 minutes of the potatoes cooking (about 15 min total), I put the chicken in a favorite dish of mine, picked up a few months ago at IKEA for 2.99. It can double as a serving dish or a baking dish. I set it on a bed of Hunt's tomato sauce (gasp! from a can--and super) that was leftover from a previous meal, then topped it with some of the mozzarella left over from Pizza Night (yay, leftover ingredients! 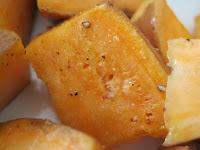 ), sprinkled some dried basil (what I had on hand), and let it all melt together into deliciousness. This dish took MAYBE 20 minutes to make, and was delicious, tasty, and reasonably healthy! 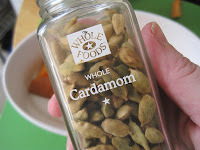 The cardamom was a nice touch--giving a sweet aroma to the potatoes, enhancing their flavor without actually adding sugar. 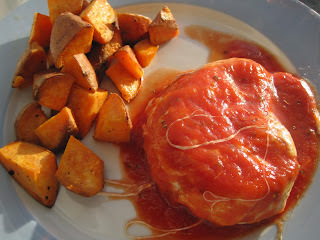 Sure, not as good as the standard Chicken-Kinda-Parm in a packet, but close enough!